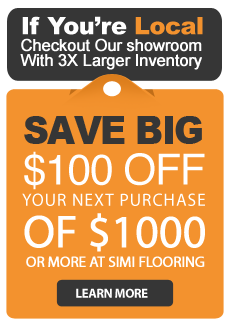 Flooring 101 Ventura County : How do I care for laminate floors? A quality laminate floor can significantly improve the feel and function of any room; however, if you want that great new floor to last for long you will need to be proactive. Caring for a laminate floor will extend its lifespan considerably; here is a brief look at the basic requirements. The more you can prevent dirt and grime from getting onto your laminate floor the less chance there will be of it getting scratched and damaged. Position doormats at all of your home’s entry points and encourage people to use them. Chairs, tables and couches tend to be moved, dragged and shifted around regularly which can lead to scratches, scrapes and gouges on a laminate floor. Having protective pads installed on the legs of your furniture and underneath major appliances will prevent them from causing damage. Dogs and cats can do a lot of damage to a laminate floor if their nails aren’t kept in check. Ensure that your pets have their nails trimmed on a regular basis so that they are never long enough to pose a risk to your floors. Like most types of flooring, too much sun can seriously damage a laminate floor but hanging curtains or blinds on any south facing windows will make a big difference. A few strategically placed rugs can also help but be sure to rotate them regularly to prevent ‘tan marks’ from developing on your floor. Laminate floors can handle an occasional spill but it is vital that you clean them up quickly, especially any liquids. Leaving spills to sit for long can lead to permanent staining and mean your floor will need replacing. The less dust and dirt you have accumulating on your floor the better, as this will reduce the chance of scratches. Use a dry mop or a vacuum with a soft brush setting to gently remove dust and do so at least once each week. To get the longest life from your floor it will need a deeper clean every couple of weeks which will require a cleaner that is specially designed for laminate floors – for best results, ask your flooring manufacturer to recommend a product. Whether you use a mop or a sponge, ensure that it is damp not wet to avoid leaving a residue. Laminate floors are rather low maintenance in comparison to most other flooring, but you still need to make an effort. To get the best performance out of your laminate floor be sure that you are playing your part.